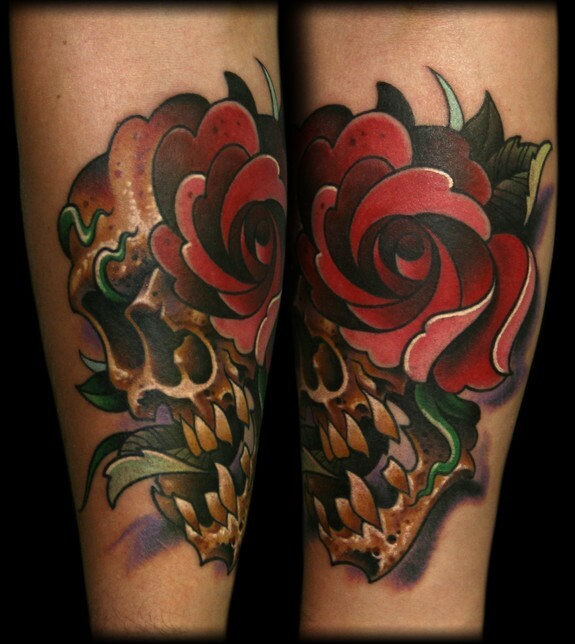 I am thrilled to feature Jeff Ensminger in today's Tattoo Spotlight. As an artist, Jeff is truly a cutting-edge talent. 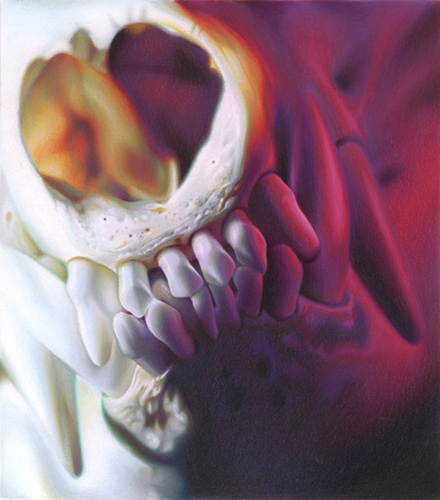 Years ago, I was first captivated by his pieces involving skull imagery, but all it took was a further delve into his portfolio to realize that every piece Ensminger touches becomes inked gold. Jeff is so skilled at adding elements of creativity to his work; imaginative components which jump out at the viewer and make his art memorable and recognizable. He was also a great inspiration to me in my decision to become a vegan a few summers ago. After almost seven years as a vegetarian, I was lucky enough to sit with Jeff for a day at a tattoo convention (he was tattooing Mike DeVries' foot, while Carson Hill was tattooing the cupcake on my hand) and throughout the day, he told me and Steve of all the excellent vegan options out there. By the time I got home that night, I was ready to make the transition. So a special, personal thanks to Jeff for that great influence. These treasures are selling out quickly and less than half of the original 100 remain, so be sure to order your copy pronto, as this beautiful book is sure to become a prized possession in your tattoo art and book collection (not to mention the endless sources of inspiration it will provide to tattoo artists and collectors alike). It was tough to choose only a handful of photos featuring Jeff's work for this Spotlight, so be sure to enjoy much more of his fantastic portfolio by paying a visit to www.JeffEnsminger.com (and order a copy of The Rose on his website while they are still available). Marker and colored pencil. 11x12" Collection of Mike DeVries.